Salvarezza travelled to Bahia Blanca to celebrate the anniversary of this institute, well known for its extensive experience in technology transfer of chemical, petrochemical and food industry. Gustavo Appignanesi, Roberto Salvarezza and Adriana Brandolin, at the 50th anniversary of the PLAPIQUI. Photo: CONICET Photography. 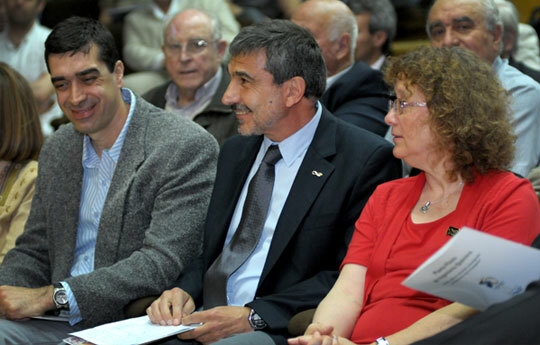 The president of the National Scientific and Technical Research Council (CONICET), Roberto Salvarezza and the chancellor of the National University of the South (UNS), Guillermo Capriste, together with the director of the Chemical Engineering Pilot Plant (PLAPIQUI, UNS-CONICET), Adriana Brandolin, celebrated the institute’s 50 years and recognized the work of its most renown founding members. During his speech, Salvarezza highlighted the vision of the founding members and said: “They thought of an institute that was created to transfer knowledge and articulated with the University”. He added that “this makes the PLAPIQUI a special institute, with a tradition and history capable of producing qualified human resources with excellent basic research. Apart from that, the institute can be considered as a reliable source for the entire region”. Regarding that, Brandolin remarked the way the institute defines the lines of research and commented: “We take into account the problems of the productive sector to satisfy current and future needs”. Besides, she said that “the key to success is to have fast and efficient answers to the submitted query”. It is important to highlight that PLAPIQUI provides services to more than 400 national and international companies. Throughout its history, the Institute managed to become a regional benchmark in knowledge generation and development of technologies for thematic areas such as Food Engineering, Catalysis, Polymer Science and Technology, Reaction Engineering and Particle Technology, Systems of Process Engineering and Thermodynamics Processes. Currently, more than 200 people – among researchers, support staff, fellows and administrative personnel – are part of the staff. “Our challenge, as a community, is to advance and provide an improvement to our economy and our society”, the president of CONICET affirmed. He added: “Let’s keep moving forward along with the University through this articulation and cooperation policy that leads to better results”. Before the ceremony, the president of CONICET, the chancellor of the UNS, the director of the PLAPIQUI and the director of the CONICET Bahia Blanca Scientific and Technological Centre, Gustavo Appignanesi, visited the construction works conducted by the Council for the buildings of Electrical Engineering Research Institute (IIIE) and the Institute of Economic and Social Research of the South (IIESS), both of double dependency.